Now, Can You Spell … Perspicacious? The eve of Election Day in Chappaqua was quiet, dark and rainy. Students were still acclimating to losing light early in the night, since time had fallen behind by an hour the day before. Schools would be closed the following day for voting that had been anticipated for two long years. The streets were calm, yet the Horace Greeley High School gymnasium was alive with eagerness and anticipation. Students, faculty, parents and community members were gathered together in a united purpose. It wasn’t for a basketball game or a wrestling match. The words that best suit this event were not Lay-Up or Pinfall. They were words like “crustacean”, “tinnitus”, “chrysanthemum”, “pharaoh” and “perspicacious”. The mascot of the night was not a Quaker; it was a Bumble Bee. The event taking place was the 9th Annual Spelling Bee. The excitement in the gym was palpable. The “Bee” is an upbeat and lively event enjoyed by participants and spectators alike. It is organized and run by Horace Greeley High School’s SHARE (Students Have a Responsibility Everywhere) student community service volunteer group. The proceeds raised benefit the Horace Greeley Scholarship Fund (HGSF), which is an organization that helps Greeley graduates fund their post-secondary education. Competing teams were comprised of families, students, members of the community and faculty. There are no restrictions on who can participate, all are welcome. There were two energized and playful four-feet-tall bumble bees buzzing around, generating enthusiasm. There were balloons, refreshments and prizes. A row of tables crossed the middle of the gymnasium floor displaying white boards, markers and bumble bee-shaped erasers for each team. Two feet in front of these tables were chairs facing the contestants; they were seats for the judges. Behind the contestants was a single microphone for the word pronouncer and a projection screen for the words to be displayed. Along the back wall was an animated crowd cheering in the stands. 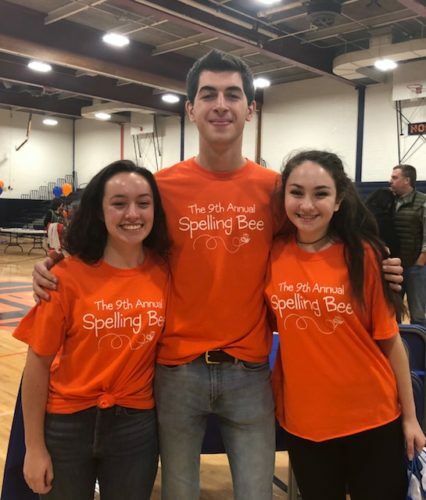 The Horace Greeley Spelling Bee showcased students working together to create a fun and inclusive event with the goal of helping their fellow students pay for college. 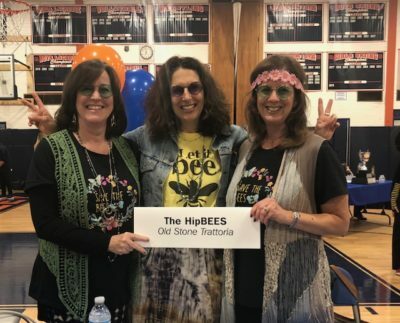 The over 60 teams were distinguished and recognizable in their cleverly themed costumes such as The Bee Gees, The Hip Bees, The Vocabulary Vampires and many more. The building excitement suddenly gave way to silence as a pause for the national anthem marked the official start of the competition. Finally, the 9th annual HGSF Spelling Bee was underway. The event was divided into rounds. Representatives from the School Faculty competed first, followed by competitors from the Middle School level, the High School level and then the Community. Lastly, there was a championship round between the winners from all competing levels to determine who would earn the ultimate prize of the trophy and winning title. Words were called out by the pronouncer, then written on white boards by the contestants. Judges held up green or red cards to indicate if the word was spelled correctly or not. At the end of each round the judges would display a number to show how many words each team spelled right. Ties moved onto a sudden death elimination. Prizes, such as bee themed water bottles and stuffed animals, were given to the winners of each section and awarded to teams with the best costumes. As the closing round drew to completion, the tension in the gym heightened. The pronouncer’s voice called over the microphone with a final “Boards Up!” The two remaining contestants raised their white boards, but only one showed the word “CATARRH” spelled correctly. The 9th Annual Horace Greeley Scholarship Fund Spelling Bee was over. 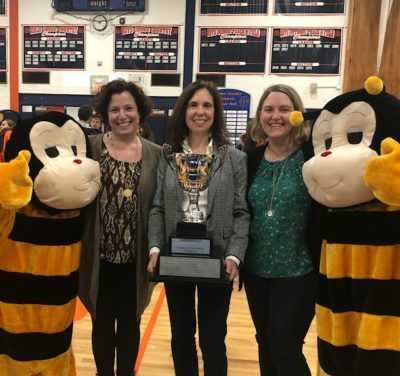 Team Hmm, a trio of Chappaqua teachers and previous winners Helen Harrison, Michelle Ramahlo and Maria Sanderleaf, was awarded the coveted trophy and the title of Queen Bees. The Spelling Bee requires skill to win; “effervescent”, “bourgeoisie” and “cayenne” are not easy words. But this event is about so much more than determining who is the best speller. The competition was ultimately created in support of a cause close to our town’s heart: education. 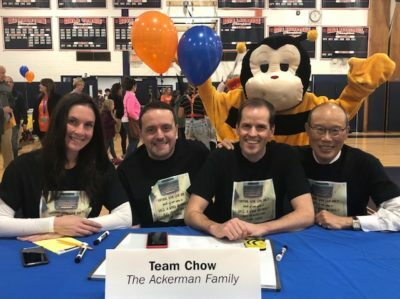 Seth Berk, a second-year competitor who doesn’t consider himself a particularly skilled speller, remarked that he was “very happy to humble himself in support of the Horace Greeley Scholarship Fund; a great cause.” In total, over $22,000 was raised, making it the most successful Bee to date. Ironically, the HGSF Annual Spelling Bee can be summarized with a word that is not difficult to spell: “Community”. Congratulations to the participants and the winners and especially to the SHARE students who did an un“bee”lievable job organizing this very special event.